8 DAY TOUR VISITING SOME OF THE BEST NATURE RESERVES IN AFRICA. SEE RHINO, BUFFALO, LEOPARDS, LIONS AND ELEPHANTS. 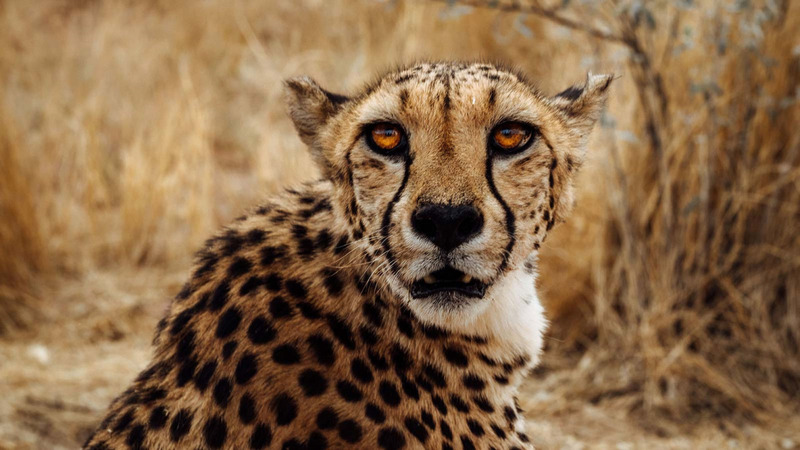 With a focus on Namibia's rich wildlife, you will visit the Okonjima Nature Reserve and the Etosha National Park where you will see a host of animals in their natural habitat. After arriving in Windhoek, you will be driven to a traditional African lodge to meet your fellow explorers. After dinner, you can watch an assortment of wild game coming to drink at the nearby waterhole. After breakfast, you will head out into the Etosha National Park. One of the greatest game reserves in the world, it offers a diverse collection of wildlife including several lion prides. Continuing through Etosha, you will spend the day searching for the park’s younger residents. To the west, black rhino and black-faced impala have established a nursery to raise their young. Most of the day will be spent on the trails as you head along the Kadesha route to the Mopane savannah. Renowned for its fine dust roads, the sand particles hang in the air like a morning mist. Today will be spent navigating the Khowarib Canyon on an off-road adventure that will take you along the scenic banks of the Hoanib River. An all-day, all-terrain adventure. A long drive lies ahead of you as you drive through a series of stunning, Martian-like landscapes on your way to Swakopmund. A surreal coastal town featuring German colonial architecture. A trip to the Namib-Naukluft Park, the largest in Africa, offers another opportunity to see more wildlife such as cheetahs, zebra and warthog. A farewell party will be held in the evening. Arriving back in Windhoek, you will get an opportunity to explore this incredible city a little more with some last-minute shopping. A final farewell as you leave your African dream behind. The instructors/hosts will communicate with guests in English. What are the driving license and minimum age requirements? All driving guests must be at least 19 years old and have held a full valid driving license for at least one year. An International Driving Permit is required. Yes, we will gladly facilitate a private tour for group bookings of 10 guests or more. The program can be tailored and adapted to meet the needs of the group. Absolutely. Our Concierge 1-888-535-8588 will be pleased to put you in touch with APS who will be more than happy to help you plan and book extended arrangements before or after your trip. APS will gladly assist you with booking your flights and travel insurance. They can be contacted via our Concierge 1-888-535-8588 or directly as follows: E-mail: info@landrover-experience.de Telephone: +49 2058 77 809 60 (09h00 – 17h00 (CET), Monday to Friday. Local operator charges may apply). We endeavor not to cancel any of our departures but in some cases this may be inevitable. We reserve the right to cancel a trip if minimum operating numbers have not been reached 8 weeks before departure. Please refer to our terms and conditions for more information. Combining the best of Namibia’s wildlife along with its remarkable geological phenomena. With visits to the Namib and the Kalahari Desert as well as the Namib‑Naukluft Park.